We don't sell books - But thought you would like to learn what is available or was available for your collection. Published 2000 Paperback 64 pages. Teaches children about boating safety by teaching puppy Maxine - recommended for young children. Mabel is in fact a real Beardie or at least a Neardie. Mabel Takes the Ferry is based on the true story of an island dog's infamous unauthorized ferry trip to the mainland one fine summer day. Mabel, mostly Beardie, loved to go sailing in Penobscot Bay. Ine day there was no room in the boat so Mabel was left behind. Being a typical curious Beardie she managed to follow thed the crowd onto the ferry headed for the mainland. She fit right in, everyone believed she was someone else's dog. Mabel spends the day playing on Lincolnville Beach, dines at theLobster Pound restaurant located there, and has a wonderful time. All the while her owner searches for her on the island. Finally she is rescued the next day - and gets her sail boat ride home. This one is around still in some specialty on line book stores and will be re-published soon. The Adventures of Raisa A Beardie Puppy by K. Suzanne Moorhouse and Illustrated by Nick Upton.Willowmead Publications. ISBN 0 9521109 2 X . Published in 2002. A delightful and amusing tale of a Beardie puppy and her first adventures. A childrens paperback book with beautiful colour illustrations on every other page. published 1997, Hardcover 122 pages. Honey, a seven month old Bearded Collie becomes lost one day. The search goes on for days. The ordeal of Honey's adventures are told by Honey herself. Wonderful illustrations contact:. The following are out of print - but may be found at some used book stores or on line auctions. Published 1993 and can be found in both Hardcover and paperback - often with a stuffed Blueberry toy and a cassette tape. Based on a true story. Bentley raised from a puppy with all the luxuries of a good home. Blueberry out in the cold and taken to a dog shelter. Ms. Moody rescues Blueberry and everyone lives happily ever after. Written in a rhyme format. The moral of the story is of course - you can find a nice pet at the shelter. Last published 1990. Previously published 1988 by Hutchinson Children Books. Hardcover 29 pages. Wonderfully illustrated (pastel like). A day in the life of Jake as he searches for "Grandpa" along the Dorset (England) coast line. He thinks out loud through the day. Typical Beardie (because he really was a Beardie), Jake bothers sunbathers, plays in the sand and surf and gets into all sort of mischief - which seems natural. What the heck, get wet - just dry off with a roll in the sand before heading home. Published many times since originally written in 1898. In fact, this is the most highly published dog book of all times. There were millions of copies published by the early 1900s. Since we are referring to Bearded Collies, the primary interest is in just a few illustrated editions. Other version show Owd Bob as a Border Collie, Rough Collie and various other. 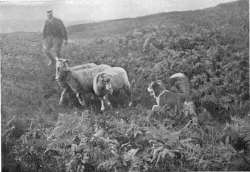 In fact, we know that in the Scottish countryside there were dozens if not hundreds of variations of sheep dog. The fact that Bob was grey narrowed it down a bit - but those who valued their dogs for herding were interested primarily in just that. No wonder the old books call many a dog a "cur." We who value the Bearded Collie, as an breed from hundreds of years ago, imagine Owd Bob as a Beardie. Beware that many of those actually have a black and white drawing or photoplate that is viewed from the back and could be just about any type of dog (including border collie). The A. L.Burt 1898 version has a front leaf that could be looked at as a Bearded Collie as does the 1903 version by Doubleday & McClure. Looking further into the later - there are various dogs depicted.in photographic plates - obviously different dogs and obviously the publisher used whatever was on hand. However, there is one addition photo that is likely closely related to a Beardie. The story itself is simply about a herding dog and its pastoral existence. But the nature of that particular dog has described the Bearded Collie in the view of many who own or know them. Perhaps it was the author's intent, or perhaps a characteristic of the typical herding dogs of the highlands. Note that Ollivant himself never said anything about the particular breed, nor did he provide photos or drawings. His description "was a veteran collie, whose grey-flecked muzzle lay along the boards, while her eyes blinked large, eternal love, as they rested on their God, Hero Ideal of the Perfect Being, thus steeping off his debauch." Or perhaps Ollivant's referral to a "Noble head" or his description "Should you, while wandering in the wild sheep land, happen on the moor or in the market upon a very gentle knight, clothed in dark grey habit, splashed here and there with rays of the moon; free by right divine of the guild of gentleman, strenuous as a prince, lithe as a rowan, graceful as a girl, with high king carriage, motions and manners of a fairy queen, should have a noble breadth of brow, and air of still strength born of right confidence, all unassuming; last and most unfailing test for all, should you look into two snow clad eyes, calm, wistful, inscrutable, their soft depths clothed on with eternal sadness-yearning, as is to be said, for the soul that is not theirs - know then that you look upon one of the line of the most illustrious sheepdogs of the North"